Malfeasance Here! A new short story! A new short story just in time for Halloween! Judge Lamentations Dewe was a Royal Witch Hunter duly appointed by His Majesty. His brief was to judge and, if necessary, execute the laws against witchcraft, cannibalism, sorcery and other unholy mannerisms used as tools of the devil at the turn in 17th century England.. But when he arrives in Bradford-on-Tyne, he finds a town haunted by a force that might mean the village’s doom … as well as his own! An Unexpected (#174) Bicentennial Banner Blog! Tales of the Unexpected was a science fiction anthology debuting in March of 1956 and lasting until issue #222 (May 1982). 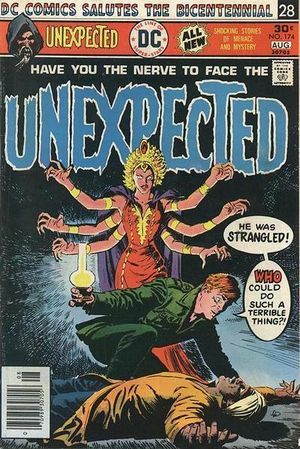 It changed its title to The Unexpected as of issue #104 in January 1968 and slowly changed formats from science fiction to horror. 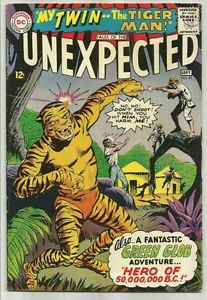 Online comic shops and guide books refer to this series as “Unexpected, The (1968)”. 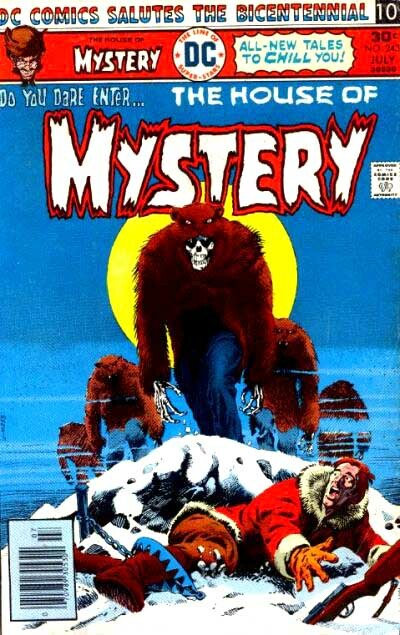 It became a Dollar Comic with issue #189 (February 1979) and merged with The Witching Hour and House of Secrets until issue #195 (February 1980) before returning to its standard format. The Witching Hour/House of Secrets merger was abandoned as of issue #206 (January 1981). 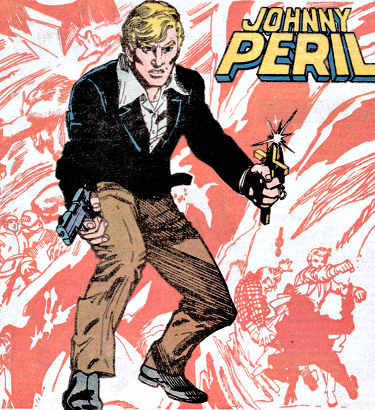 Most of these last issues featured the adventures of Johnny Peril, detective of the occult. Before that, the only lasting feature of note was in the mid-1960s with Tales of the Green Glob. Dr. John Terril, world-renowned psychiatrist, is hired to analyze the paranoid president of a foreign republic. He is informed by Scorbo, the president’s lackey and an obvious germophobe that there really IS a plot to kill the president (it is not said what his position is or relation to the president)! If Terril can withstand the Gauntlet of Fear, he can infiltrate the organization led by the Great Bajir. He is thrown into an underwater cave and attacked by a giant squid and piranhas. He panics, faints and wakes up in a cell. Scorbo is really the Great Bajir and he is brainwashing Terril into one of his thralls to kill the president! The brainwashing continues: bats, spikes and skulls haunt Terril. Even the roaches in the cell panic him. But he has an idea. He starts crawling in his cell like a baby. Bajir enters his cell, thinking his plan worked. Terril tosses handfuls of roaches onto Bajir, panicking HIM! The thralls see their master in panic and snap back to their old selves and hurl Bajir from the window of his castle. Gerald is the new English secretary to millionaire Raj Simha of an unnamed Indo-Asian country. Gerald is warned to stay away from the Raj’s daughter Kaleli. But Gerald delivers flowers and breakfast in bed to Kaleli, walks with her in the garden and falls in love. Simha refuses to allow Gerald to marry and forbids any further contact. Unexpected Mail: the letter column does not necessarily comment on previous issues, but instead, like Ghosts, readers submit brief tales that fit the genre of the comic. Damian Brokaw of Denver, CO tells us of pygmy chimpanzees – the possible missing link! Janet Fadel of Hollywood, CA notes that issue #172 features an exorcism as well as an article about the upcoming film “Exorcist 2” and discusses the film, Robert W. Chan of Edmonton, Canada writes about a 1969 case in Louisiana when water turned blood red. Ronald Vias of Dover, NJ discusses an Allied WWII plan to plant incendiary devises on nocturnal animals and bats and sic them on Nazi strongholds. Other articles discuss upcoming movies about the Loch Ness Monster and “Dr. Black and Mr. Hyde”. Weird War Tales #47: DC’s Weird Bicentennial Salute! The Reese’s Peanut Butter Cups of comic books. “You got your horror comic in my war book!” “You’ve for your war book in my horror comic!” I loved this comic book, just LOVED it! It combined the two genres at which DC excelled! 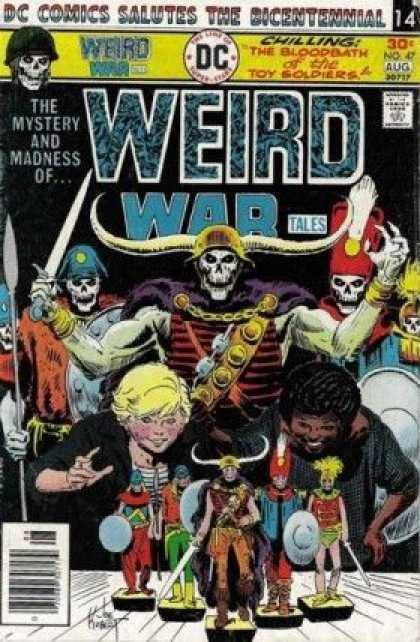 Weird War Tales debuted in September 1971 and lasted 124 issues until June of 1983. It was an anthology of supernatural stories set during a war. Any war. Vikings, Nazi’s, Yanks & Rebels and post-apocalyptic tales were represented. 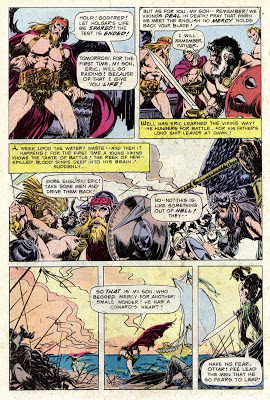 Although not a “personality” such as Cain, Abel or Destiny, the comic was “hosted” by death – a skeleton dressed in a uniform appropriate for the story. By the 1980s, regular features or “stars” were introduced – alternating between GI Robot, the Creature Commandos and the War that Time Forgot (dinosaurs) – sometimes alternating between features, sometimes teaming with each other. By that time, though, it had lost some of its horror pedigree in favor of more quasi-superheroics. In a post-apocalyptic world, despotic General Arax’s son Zeron plays with toy soldiers, exactly matching both sides’ moves in the next day’s battle. Arax’s aides, secretly loyal to the opposing force’s democratic leaders, change Zeron’s next battle plans, leading to a huge defeat. In a fit of pique, Arax destroys the toy soldiers. When Arax finds Zeron playing with one last toy soldier the boy kept hidden, the general, Arax throws it in the fire. Arax melts along with the toy replica. The sole survivor of the Great Atomic War hears a cry for help in the rubble. He digs and digs and finds a tape recorder accidentally turned on in the shifting debris replaying a radio soap opera, “Help! Help! Unhand me you brute!” In frustration, he bashes the tape recorder against a wall, causing the fragile masonry to give way and crush him. 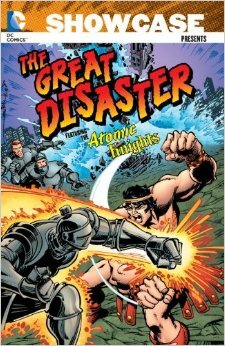 This two-page tale is reprinted in the trade paperback “Showcase Presents: the Great Disaster featuring the Atomic Knights”. Hulgar, the elderly Viking, duels Godfred to prove he still is a warrior. Eric, son of their leader Ottar, begs for mercy for Hulgar. Ottar grants it. During his first raid, Eric panics and is branded a coward. Holgar gives Eric the Shield of Thor that will make him invincible! With the shield, Eric defeats Godfred to earn his place in the next raid. Eric fights bravely against the British, but is killed. Linus Sabalys, Lavel PQ, Canada; positive comments on some stories, negative for others. Mark Schmieder, Concord, MA; the editor points out that Mark has the opposite view as Linus Sabalys on every story. John Elliott, New York, NY, positive, but requests novel-length tales instead of serializing stories over multiple issues. Join me next time for DC’s Bicentennial issue #15: Four Star Spectacular #3. Only the most ardent Marvel zombie would refuse to admit that of all the possible comic book genres published by both DC and Marvel, DC at least led in the horror division. 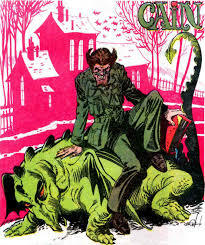 Marvel published many a horror title, but with a few exceptions, they featured reprints from the 1950s and early 1960s. Most comics of their line rarely lasted over a year. DC’s horror titles featured new stories with rare exceptions. 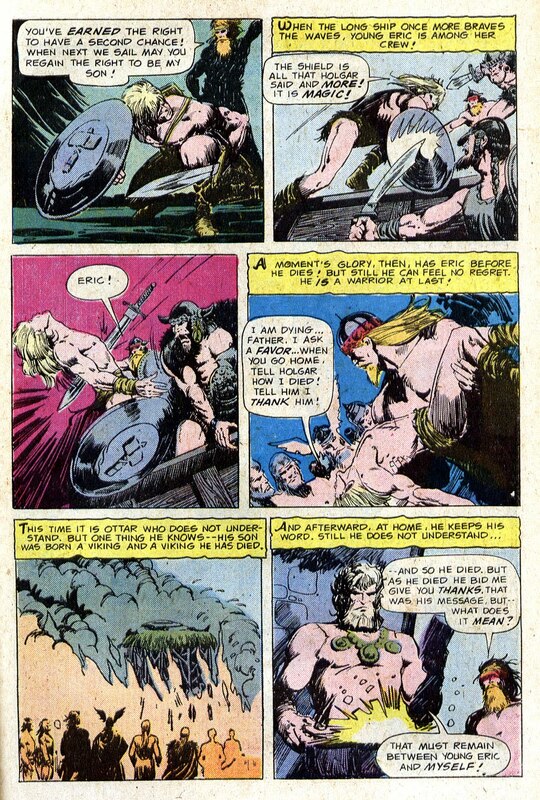 Ghosts differed even from the DC fare in two ways: until its last few issues it did not have a “host” introducing the stories or otherwise having a framing segment to introduce and finish a tale (other than text boxes on the first and last panels) and until issue #75 (April 1979), it claimed its stories were true! 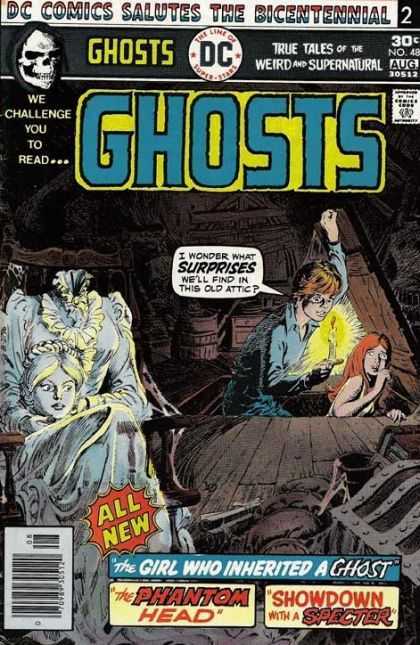 Ghosts was published from September-October 1971 until issue #112 (May 1982). (Boy is my spell-checker going berserk over the first two words of that last sentence…). In 1968 Villem Kruger and his family visit his grandfather’s diamond mine abandoned decades before. When Villem moves away stones blocking the mine – he releases the ghost of a worker killed in the mine. The ghost vows to destroy the descendant of the evil Kruger. Villem’s son Jon offers to take the place of his father for the ghost’s revenge. July 1505: Michelangelo is haunted by a floating head – every painting and sculpture he tries to complete has the head of the ghost. If he does not complete the portrait of Cesara Borgia by the end of the week, Borgia will likely take Michelangelo’s head! Even the pope cannot help! The ghost stops visiting Michelangelo after his disappointing visit to the pope and all is well. The painting of the floating head is found 288 years later and identified as the head of King Louis XVI, who was decapitated during the Revolution! In France in April 1957, the mother of painter Gaston Poulard is angry at him for marrying Californian Becky. Rightly so – Becky is a gold digger who is after the mother’s fortune! Becky stands by during the mother’s fatal heart attack; holding the mother’s heart medicine. The mother’s ghost haunts Becky – throwing plates at her and chasing her through the house! Mrs. Poulard sends a letter to a ghost hunter, Henry Thorson-Jones (they don’t call him a ghost hunter per se, but you know …) to rid the house of the intruder. The ghost tricks the hunter into pushing Becky down the staircase, killing her. Thorson-Jones discovers the letter sent by Mrs. Poulard was NOT his wife, but his mother – written and mailed after her death. The intruder written about in the letter … was Becky! Text feature: The Jigsaw Ghosts. Written (presumably) by Murray Boltinoff. This text feature was in the place of a letter column. November is National Adoption Month! Throughout the month I’ll feature famous folk who have been adopted! 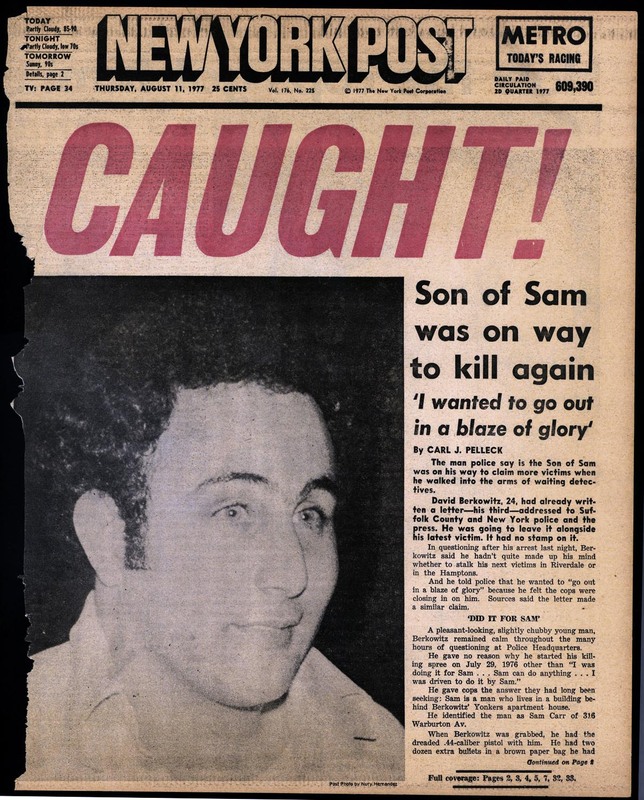 David Richard Berkowitz (born Richard David Falco, June 1, 1953), also known as the Son of Sam and the .44 Caliber Killer, is an American serial killer convicted of a series of shooting attacks that began in the summer of 1976. With a .44 caliber Bulldog revolver, he killed six victims and wounded seven others by July 1977. As the toll mounted, Berkowitz eluded a massive police manhunt while leaving brazen letters which promised further murders. Highly publicized in the press, he terrorized New York City and achieved worldwide notoriety. After his arrest by New York City police in August 1977, Berkowitz was indicted for eight shooting incidents. He confessed to all of them and claimed a demon that possessed his neighbor’s dog had commanded him to kill. In the course of the police investigation, he was also implicated in many unsolved arsons in the city. David Berkowitz was born Richard David Falco on June 1, 1953, in Brooklyn, New York. His mother, Betty Broder, grew up in an impoverished Jewish family and later married Tony Falco, an Italian-American Catholic. The couple ran a fish market together. They separated before Berkowitz’s birth: Falco left for another woman, and Broder later had an affair with a married real estate agent, Joseph Kleinman. When she became pregnant, Kleinman threatened to abandon her if she kept the baby, so she put the child up for adoption and listed Falco as the father. Within a few days of his birth, the infant boy was adopted by Pearl and Nathan Berkowitz of the Bronx. The Jewish-American couple were hardware store retailers of modest means, and childless in middle age. They reversed the order of the boy’s first and middle names and gave him their own surname, raising young David Richard Berkowitz as their only son. 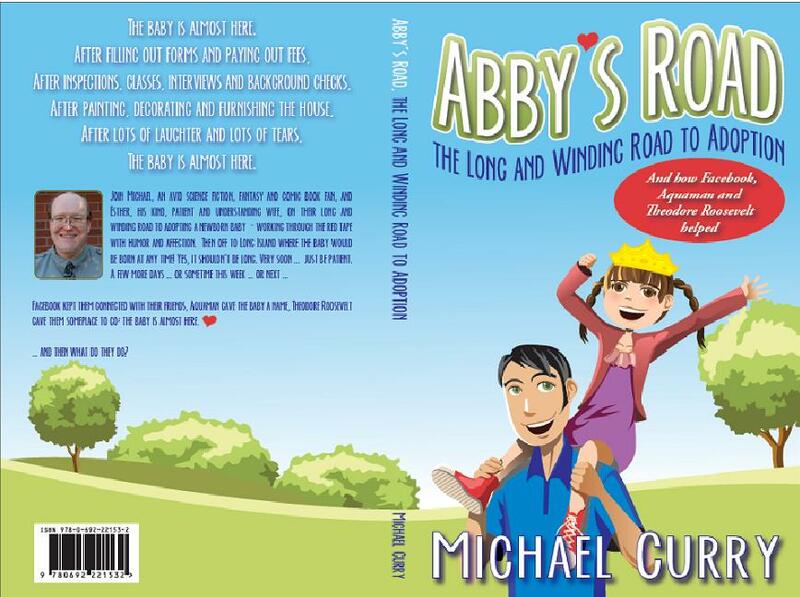 Be sure to visit Abby’s Road on Facebook for more Spotlights!